If you live by the workstation, you die by the performance. When it comes to processing data, throughput is key: the more a user can do, the more projects are accomplished, and the more contracts can be completed. This means that workstation users are often compute bound, and like to throw resources at the problem, be it cores, memory, storage, or graphics acceleration. 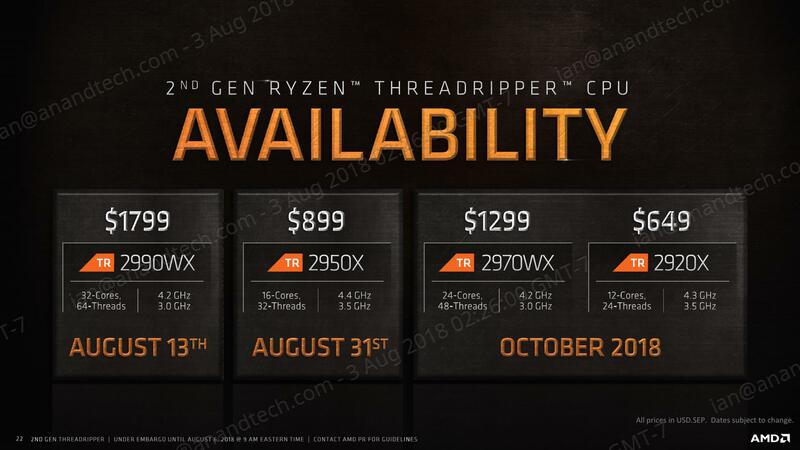 AMD’s latest foray into the mix is its second generation Threadripper product, also known as Threadripper 2, which breaks the old limit on cores and pricing: the 2990WX gives 32 cores and 64 threads for only $1799. 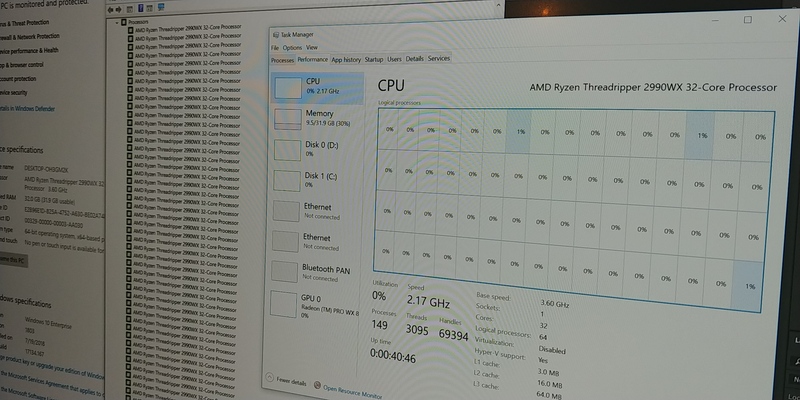 There is also the 2950X, with 16 cores and 32 threads, for a new low of $899. We tested them both. Ever since AMD launched its first generation Ryzen product, with eight cores up against Intel’s four cores in the mainstream, the discussion has been all about how many cores makes sense. The answer to this question is entirely workload dependent – how many users have a single workload in mind, or how many will use a variety of tools simultaneously. The workstation market encompasses a wide range of distinct power users, and despite the need for speed, there is rarely a one-size fits all solution. AMD’s first generation of Threadripper, launched in 2017, introduced 16-core processors to the masses. Previously only available on the server platforms, these new parts were priced very competitively against 10-core offerings. AMD had ultimately used its server platform, with a few tweaks, to attack a competitive landscape where Halo products are seen as king-of-the-hill. Intel’s own workstation products, previously named E5-2687W and relied on dual socket servers, were literally that – servers. After launching its latest high-end desktop platform, with up to 18 cores, Intel then subsequently launched the Xeon W-series, which replaced the E5-W parts from the previous generation. Again, these were up to 18-cores for ~$2500, but required special chipsets and motherboards. 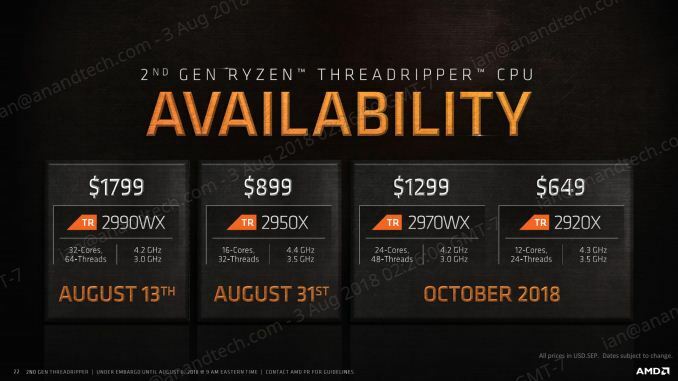 Today AMD is officially putting out for sale its second generation of Threadripper. These new parts attack the market two-fold: firstly by using the improved Zen+ microarchitecture, giving for a 3% IPC increase in core performance, but also using 12nm, driving up frequencies and reducing power. The second attack on the market is core count: while AMD will be replacing the 12 and 16 core processors with new Zen+ models at higher frequencies, AMD also has 24 and 32 core processors for up to $1799. When comparing 32 cores at $1799 against 18 cores at $2500, it seems like a slam dunk, right? The first generation server processor line from AMD, called EPYC, uses four silicon dies of eight cores each to hit a the full 32 core product. These parts also had eight memory channels and 128 lanes of PCIe 3.0 to play with. In order to make the first generation Threadripper processors, AMD disabled two of those silicon dies, giving only 16 cores, four memory channels, and 60 lanes of PCIe. The end product was sold focused at consumers, not server customers. For 32 cores, AMD takes the same 32-core EPYC silicon, but upgrades it to Zen+ on 12nm for a higher frequency and lower power. However, to make it socket compatible with the first generation, it is slightly neutered: we have to go back to four memory channels and 60 lanes of PCIe. AMD wants users to think of this as an upgraded first generation product, with more cores, rather than a cut enterprise part. The easy explanation is to do with product segmentation, a tactic both companies have used over time to offer a range of products. As a result, one way of visioning the new second generation 32-core and 24-core products is bi-modal: half the chip has access to the full resources, similar to the first generation product, while the other half of the chip doubles the same compute resources but has additional memory and PCIe latency compared to the first half. For any user that is entirely compute bound, and not memory or PCIe bound, then AMD has the product for you. In our review, we’ll see that this bi-modal performance difference can have a significant effect, both good and bad, and is very workload dependent. 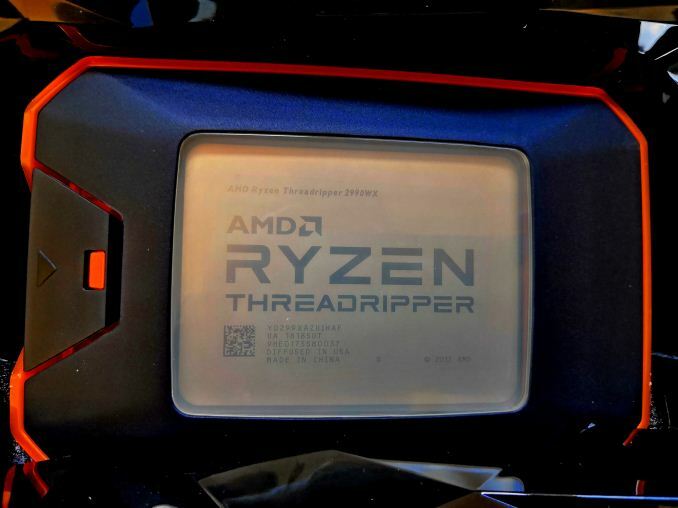 The official announcement last week showed that AMD is coming to market with four second generation Threadripper processors. Two of these will directly replace the first generation product: the 16-core 2950X will replace the 16-core 1950X, and the 12-core 2920X will replace the 12-core 1920X. 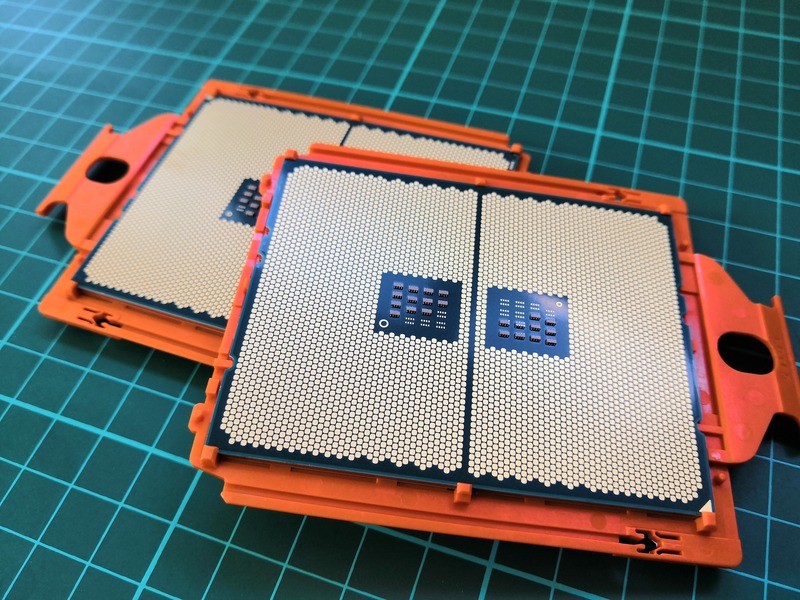 These two new processors will not be bi-modal as explained above, with only two of the four silicon die on the package being active (the 16-core will be a 8+0+8+0 configuration, the 12-core is a 6+0+6+0). Sitting at the bottom of the stack will be the first generation 8-core (4+0+4+0) 1900X that also offers quad-channel memory and 60 PCIe lanes. The two new processors are the 32-core 2990WX and the 24-core 2970WX. They will enable four cores per complex (8+8+8+8) and three cores per complex (6+6+6+6) respectively, and are under the bi-modal nature of the memory and PCIe. The naming changes up to WX, presumably for ‘Workstation eXtreme’, but this puts the product in the same marketing line as the Radeon Pro WX family. The AMD Ryzen Threadripper 2990WX is the new halo product, with 32 cores and 64 threads coming in with a base frequency of 3.0 GHz and a top turbo frequency of 4.2 GHz. The idle frequency of this processor is 2.0 GHz, and when installed we saw 2.0 GHz on any core without work – it almost becomes the dominating frequency if the CPU isn’t constantly loaded. The 2990WX will be available from today and retail for $1799. The other member of the WX series is the 2970WX, which disables one core per complex for a total of 24 cores. With similar frequencies as the 2990WX, and the same TDP, PCIe lanes, and memory support, this processor will be launched in October at the $1299 price point. With fewer cores being loaded, one might expect this processor to turbo more often than the bigger 32-core part. For the X-series, the TR 2950X is our 16-core replacement, taking full advantage of the better frequencies that the new 12nm process can give: a base frequency of 3.5 GHz and a turbo of 4.4 GHz puts the previous generation processor to shame. In fact, the 2950X is set to be the joint highest clocked AMD Ryzen product. With that bump also comes a price drop: instead of $999 users can now get a 16-core processor for $899. The 2950X is due out at the end of the month, on August 31st. Bringing up the rear is the 2920X, sitting in to replace the 1920X and with a similar trade-off to the other parts. As with the 2950X, the frequencies are nice and high compared to last year, with a base frequency of 3.5 GHz and a turbo of 4.3 GHz. This is all in a thermal design package of 180W. AMD told us that the TDP ratings for Threadripper 2, in general, were fairly conservative, so it will be interesting to see how they hold up. The 2920X is also out in October, going for $649 retail. Thermal Comparisons: Remember to Remove the CPU Cooler Plastic!